Lee Sedol 9p defeated Park Junghwan 9p in the final of the the 27th Asian TV Cup, on August 28, 2015. The final was played in Seoul, Korea, and Lee won by resignation after 207 moves. Lee Sedol played wonderfully against Park Junghwan in the final, and added a 4th Asian TV Cup to his international record. Park Junghwan 9 dan (left) and Lee Sedol 9 dan at the 27th Asian TV Cup final. Lee Sedol won the 19th Asian TV Cup, defeating Chen Yaoye 9p in 2007, and he won again the following year, defeating Cho Hanseung 9p. Lee Sedol won his 4th Asian TV Cup title. In 2008, both Lee Sedol and Cho Hanseung donated their prize money to the Sichuan earthquake relief fun. In 2014, Lee defeated Kono Rin 9p in the final, and it was his 3rd Asian TV Cup title. In 2009, just before the 21st Asian TV Cup, Lee decided to retire. The final against Kong Jie 9p was his last game before his retirement. Lee decided to make a comeback after taking a 6 month break, and he soon recovered his strength and sense of play. This was very fortunate for Go fans, including myself, who enjoy watching Lee’s dynamic and insightful style of play. Meanwhile, this was Park Junghwan’s 2nd Asian TV Cup final. Park Junghwan 9 dan was the runner up at the 27th Asian TV Cup. He was in the final of 25th Asian TV Cup in 2013, but he lost to Iyama Yuta 9p and it was a painful defeat for him. That’s because Park and Iyama were ranked #1, in Korea and Japan respectively, at the time. Many of his fans in Korea were disappointed when he lost to Iyama. This time, he defeated Liao Xingwen 5p and Lee Donghoon 5p to proceed to the final, but his run was stopped by Lee Sedol. The head to head record between Lee Sedol and Park Junghwan is 13-6 in Lee’s favor, including this final. It looks like Park still hasn’t overtaken Lee, even though Park’s been ranked #1 in Korea for nearly two years now. Ichiriki Ryo 7 dan (left) and Yang Dingxin 3 dan at the 27th Asian TV Cup. All the Japanese players in this event were eliminated at an early stage. Iyama Yuta won the tournament in 2013, and Kono Rin came 2nd in 2014, but this year’s results weren’t satisfactory for the Japanese players. Ida Atsushi 8p and Ichiriki Ryo 7p were also defeated, by Lee Donghun 5p and Yang Dingxin 3p respectively. China’s representatives didn’t fare much better. Yang Dingxin won his 1st round game, but he lost to Lee Sedol in the semifinals. Meanwhile, Liao Xingwen 5p was defeated by Park Junghwan in round 1. Kong Jie 9p has won the Asian TV Cup three times in a row, from 2009 to 2011, but somehow Chinese players haven’t done well in this lightning tournament since then. The Asian TV Cup is a lightning Go tournament open to the winners and runners up of domestic Chinese, Japanese and Korean lightning tournaments. The name ‘Asian TV’ came about because the domestic lightning tournaments were all sponsored by local broadcasting stations – CCTV, NHK and KBS respectively. However, in 2013, China spoiled the party by changing the sponsor of their qualifying tournament to CITIC Bank. Beijing, Tokyo and Seoul take turns as tournament hosts. The previous year’s winner is seeded into the semifinals while the other six players battle it out for the three remaining semifinal places. The players receive 10 minutes main time and 30 seconds byo-yomi for their games. Yang-Dingxin 3 dan (left) and Lee Sedol 9 dan at the 27th Asian TV Cup semifinals. “It would be great if there was a system in place to help people who want to play in the pair-go but don’t have a partner to find one”…”Live broadcasting was good, but I’d rather see live pro comments on a large room with many go players”…”Include the topics discussed on the pro lecture schedule board”…These are just a few of the many suggestions submitted on the US Go Congress Survey. Whether you’ve attended a Go Congress or not, Congress organizers are interested in your opinions on a few basic questions so that they can make future Congresses even better. Click here by midnight this Wednesday to take the brief survey; participants are eligible for go prizes! Young players make Agon Kiriyama Cup semifinals: The remaining two quarterfinals of the 22nd Agon Kiriyama Cup were played recently. On August 10, Kyo Kagen 3P (B) (aged 15) beat Shuto Shun 7P by resignation. On August 13, Yo Seiki 7P (B) (aged 20) beat Matsumoto Takehisa 7P by resignation. Kyo and Yo will play each other in one semifinal; the other matches Iyama Yuta (aged 26) and Son Makoto 3P (aged 19). As you can see from the ages, all four are young players, though Iyama is already a veteran in experience. The recent results of the Taiwanese players Yo and Kyo show that they both have exceptional promise; they will probably be titleholders before too much longer. Iyama reaches Oza final: The first semifinal in the 63rd Oza tournament was played on August 17. Iyama Yuta (B) beat Yuki Satoshi by resignation. The other semifinal pits Ko Iso 8P against Yo Seiki 7P. The winner will meet Iyama in the play-off to decide the challenger on September 7. Yoda stumbles in top Kisei league, Kono wins A League: In a game played in the S League, the top league, in the 40th Kisei tournament, on August 13, Yamashita Keigo 9P improved his score to 3-1 when he beat Takao Shinji Tengen by 2.5 points. At this point he was in second place. League leader Yoda Norimoto 9P (left) suffered a painful loss in the S League on August 20. Taking white, he lost to Yamashiro Hiroshi 9P by half a point. On 3-1, Yoda now shares the lead with Yamashita Keigo 9P, who has the advantage of being ranked higher (number one) ? there is no play-off within the Kisei leagues. Yamashiro goes to 2-2, so his chances of keeping his place improve. Kono Rin scored his sixth successive win in the A League in a game played on August 13. Taking black, he beat Cho Riyu 8P by 2.5 points. Everyone else in the league has at least two losses, so Kono wins the league regardless of his result in his final game. He also secured promotion to the S League next year. In the knock-out tournament, he will have to win four games in a row to become the challenger whereas the winner of the S League has to win only one game in what is called an “irregular best-of-three.” How this works is that Kono would have to beat the winner of the game between the B and C League winners (both of whom have to win five games to become the challenger), next win a game against the second-place-getter in the S League, then beat the winner of the S League twice in a row. The latter is given an advantage of one win in the final play-off, so his opponent can’t afford to lose a game. That means that in practice, there can’t be a third game in this “best-of-three,” as the winning score will always be 2-0. Tomorrow: 28th Women’s Meijin League starts; Japan eliminated from TV Asia Cup; New women’s tournament with biggest prize; Death of Cho Chikun’s wife. Forty two go players signed up for the Mexican Open, a three-day, six-round tournament this weekend which is the main event of the second Coloquio de Go, or Go Congress, in Mexico City. “Enthusiasm for go is much newer in Mexico than in the United States, but they have a bright future with indefatigable organizer, registrar and TD Emil Garcia,” reports Steve Burrall. Garcia (seated in blue shirt) is also a very strong player, who placed sixth in the recent Prime Minister’s Cup. Saturdays’s two rounds were followed by a lecture from Myungwan Kim 9p on a game he played with Lee Sedol that was a watershed event in his go playing career. Kim then played a simultaneous match with 12 local players. The photo at right, the view from board #8 in the tournament room, shows the ruins of Tlatelolco, a former pyramid transformed into an adjacent church by the Spaniards. Yutopian Offers Extra 10% Discount: Buy two go books at Yutopian and, in addition to existing discounts, get an extra 10% off with free U.S. shipping (offer only good for shipping to US addresses). Yutopian has an extensive collection of go books, from Nie Weiping on Go, Art of Capturing Stones, Yilun Yang’s Ingenious Life & Death Puzzles (Volumes 1 & 2) and more. Two New Bozulich Essays at Kiseido: Kiseido has just uploaded two new essays on go by Richard Bozulich. The first essay, “Increasing your Concentration and Powers of Analysis through Visualization” explains how solving life-and-death problems by memorizing the position, then solving the problem in your head, is an efficient way to improve your analytical abilities. 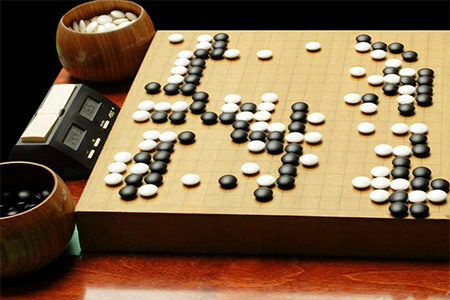 The second essay, “Microgo,” introduces a variant of the go rules that makes play on boards with grids as small as 2×2 possible. This game is from the 2013 Samsung Cup, round of 16. The game was played between Lee Sedol 9p and Chen Yaoye 9p on October 8, 2013, in Daejeon, Korea. Chen Yaoye 9 dan (left) and Lee Sedol 9 dan at the 2013 Samsung Cup, round of 16. Lee Sedol and Chen Yaoye already played each other in the group stage of this Samsung Cup, and Chen won the game. Chen Yaoye 9 dan at the 2013 Samsung Cup, round of 16. However, Lee defeated Komatsu Hideki 9p to pass through the group stage, and they faced in the round of 16 again. They also played at the 9th Chunlan Cup final in June 2013, and Chen defeated Lee and winning the title with a 2-1 score. That was Chen Yaoye’s first career international title, and it seemed as if Chen’s period had begun. After Chen won the 9th Chunlan Cup, many Go fans regarded him as the strongest player in the world. That’s because both Chen and Lee were ranked #1 in China and Korea, so their final was regarded as a grand final. The title deciding game of the Chunlan Cup was a masterpiece of these two players. Lee Sedol was in deep slump in the 1st half of 2013. He lost to Park Junghwan 9p in the 14th Maxim Cup final, and he was also defeated by Kim Jiseok 9p in the 18th GS Caltex Cup final. Lee Sedol 9 dan at the 2013 Samsung Cup, round of 16. However, he was getting better from the slump in the 2nd half of 2013, and he was in good form again when he was playing this game. Many of his fans still considered him as the best player, and he needed to show his power and strength in the international matches like this Samsung Cup. Their head to head records before this game was tie with 5-5. However, Chen was winning their last three games in a row, and I assume that this would have been a tough game for Lee. Chen was very strong against top Korean players by that time, with his solid and defensive style of play. He hardly made mistakes when he was in good shape, and he was getting stronger against Lee as well. Anyway, let’s have a look at their dynamic game. The inaugural American Chang Qi Cup, scheduled for September 26-28 at Harvard University in Cambridge, MA, is shaping up to be an exciting event, and over 100 players have already registered. The 2015 Chang Qi Cup is the first time that the semi-finals of an international professional tournament will be held in North America. Four top pros from China will compete for a berth in the Chang Qi Cup finals. This event will also include the inaugural American Chang Qi Tournament, an AGA-rated tournament with significant cash prizes. The American tournament features a top prize of $4,000 for the open section, and generous prizes for all division winners. Hosted by the American Collegiate Go Association (ACGA) and the Shanghai Ing Foundation, special activities are planned, including the Tsumego Challenge, in which competitors solve rapid-fire go problems for small prizes. And for participating college students only, there will be an extra event: free bowling on Saturday night. Similar to the AGA E-Journal’s expanded video coverage at this year’s US Go Congress, local organizers are planning complete coverage of the event through video streaming. Professional commentary on the Chang Qi Cup games, commentary on the top boards of the American tournament, and even special interviews will all be broadcast. Hotels for the weekend are filling up quickly, so the ACGA urges registrants to book soon. Visit the website for details and registration. Kudos for Swift Ratings: “I’ve complained before about the timeliness of ratings updates, so let me be the first to compliment those responsible for getting it done swiftly this year,” writes Brady Daniels. The following US Go Congress tournaments have now been rated: US Open, US Open Masters, Congress Self-Paired, Congress DieHard and Congress U16 AGA Girls’ Championship. Click here for latest ratings. “Meeting all the other people who love to play go as much as I do”…”Pro game review is the single most important activity at the Congress” …” I have attended only two US Go Congresses in the past ten years, but follow them avidly each year and attempt to visit each year.” These are just a few of the more than 100 responses thus far to the US Go Congress Survey. So far, the US Open and pro lectures rank highest in popularity, while the 9×9 and 13×13 tournaments rank lowest. Whether you’ve attended a Congress or not, Congress organizers would like your opinions on a few basic questions so that they can make future Congresses even better. “One of the best things is simply meeting people who love the game and playing go.” Click here to take the brief survey; participants are eligible for go prizes!